When I first interviewed David MacKenzie of Clever Mojo Games back in July of last year, I wasn’t quite sure what to make of the Alien Frontiers and Kickstarter phenomenons. I knew that I was fascinated with how a small company could create such a big buzz in such a short time, and so down the rabbit hole I plummeted. 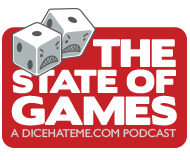 After playing and loving Alien Frontiers, naming it the Dice Hate Me Game of the Year for 2010, and getting to know David, his brother Fred, and the amazing things that Clever Mojo Games has been up to in the past year, I can safely say that it has been a great trip… and it’s far from over. 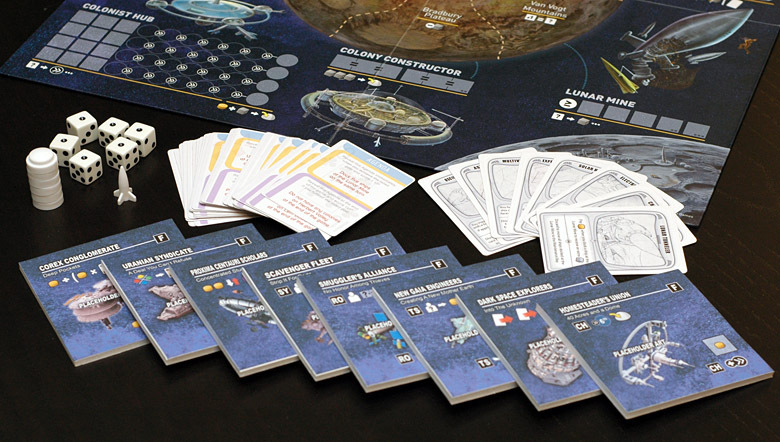 Clever Mojo – and Alien Frontiers – is now back on Kickstarter with Alien Frontiers: Factions, an expansion for the base game that introduces player agendas, factions with special powers, more Alien Tech, and extra bits that will allow an extra player to join the fray. Having playtested Factions several times over the past couple of months, it has been exciting to watch its development; the player agendas, in particular, have evolved quite a bit in that time and now add a rich depth to gameplay. The base goal of putting as many colonies on the planet’s surface remains unchanged, but the Agenda cards now give players extra incentive to colonize certain territories, pull off unique moves or employ different tactics during the game. Each Agenda card has two agendas. The first agenda on a card will grant 1 VP when a specific requirement is met during the game. These requirements can range from the insane – “Build two ships at the Shipyard on the same turn” or “Gather your fleet of seven ships” – to the fairly mundane – “Launch a colony from the Colonist Hub, then start work on a new colony on the same turn” or “Use the Orbital Market at a time when you do not control Heinlein Plains.” The second agenda listed on a card is a special end-game scenario that must be met in order to score extra VPs. These are usually related to aspects of area control on the board, such as “Control Lem Badlands at the end of the game.” However, some end-game agendas are much more wild, such as “Possess a Booster Pod and an Experimental FTL Drive (one of the new Alien Tech cards) at the end of the game.” That last one is one of my personal favorites, as the Booster Pod is my second favorite Tech from the original game, and the art on the cards tie them closely together in theme. In addition to Agendas, Factions introduces eight new Alien Tech cards that could easily be the only thing that many players choose to mix into their base game on a regular basis. All eight cards are pretty handy, but two of my favorites have to be the Lunar Tunneler – “Pay 1 Fuel when you dock a ship at the Lunar Mine to receive an extra Ore” – and the Electrofabricator – “Pay 2 Fuel to receive 1 Ore.” These cards are especially useful when the game involves a full five players, as resources can become scarce very quickly. The new Alien Tech cards are tightly integrated into the expansion, as they can interact with new powers and abilities very readily. 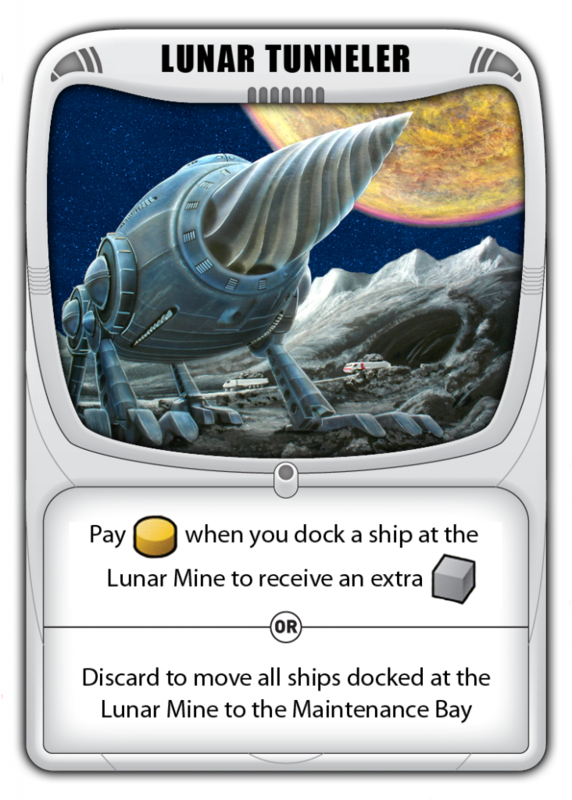 For instance, the discard power of the Lunar Tunneler – “Discard to move all ships docked at the Lunar Mine to the Maintenance Bay” – can be used as part of a devastating combo, along with one of the Agenda cards – “Dock five ships at the Lunar Mine on the same turn.” If a player can manage to pull off that particular trick, they’ll end the turn with five ore and an extra VP. Not too shabby! If the new Alien Tech and Agenda cards were all that were included in the expansion, it would still be worth checking out. However, the box also includes the titular powers – the Factions. These Factions represent groups racing to stake their claim on planet Maxwell, and they all have a unique ability that is only available for the controlling player to use, as well as a docking hub, where all players can dock a ship, pay one Fuel, and activate a Faction-specific power. At the beginning of the game, the eight Faction boards are given to the player who would go last in the turn rotation, and that player chooses one Faction. The boards are then passed down the line in reverse turn order. Of all the additions in the expansion, the Factions include the most varied subtleties for addition to gameplay. 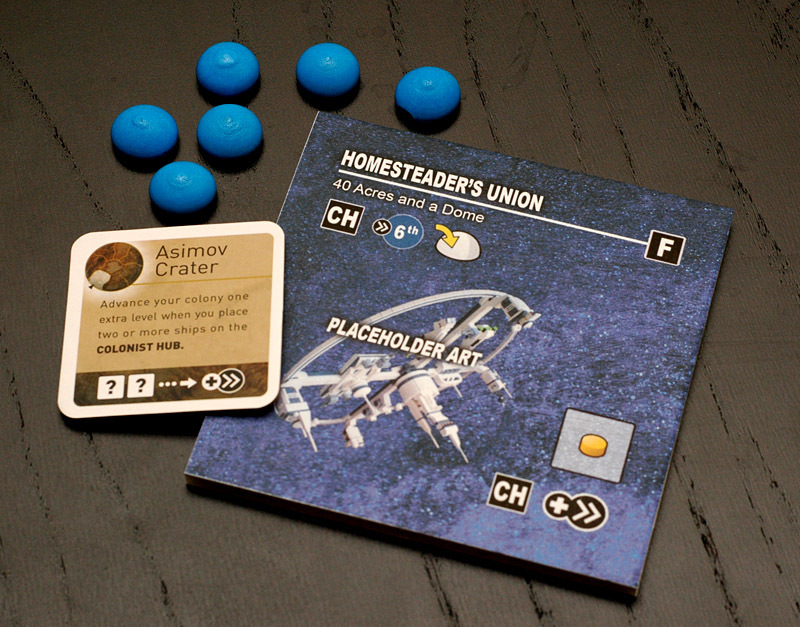 There are some Factions that provide an obvious boon to players; the Homesteader’s Union, for instance, allows the controlling player to launch a colony from the Colonist Hub when a colony reaches the 6th space on the hub track, instead of the 7th. This is great news for those who love to employ what I’ve come to call “the Grandma strategy” of only focusing on the Colonist Hub each turn. 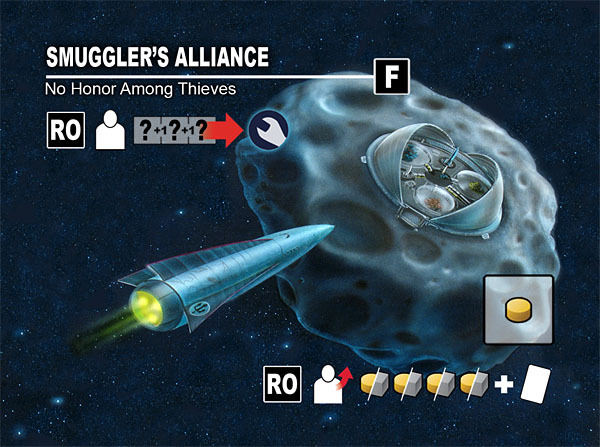 However, other Factions can be just as powerful, but require a little more finesse; the Smuggler’s Alliance may use any three-ship sequence to bump ships already docked at the Raider’s Outpost, regardless of the sequential value. This can be a boon to those who like to live the pirate’s life, but it often requires a good bit of luck, or at least control of a trusty Booster Pod in order to pull off on a regular basis. One of the great features of the Factions boards is the ability of any player to use an aspect of that Faction’s powers if they dock a ship there and pay a Fuel. The Scavenger Fleet facility benefit is a great example of this usefulness – when a player docks a ship here and pays one Fuel, they may then dock two ships of any value (not just doubles) at the Shipyard in order to build a new ship. The use of these extra abilities often helps to offset the limits of the facility spaces in a five-player game, however, it’s important to note that each Faction only has one space allocated for a docking ship. If a player already has a ship docked there, you’re out of luck – unless you happen to possess my favorite Alien Tech, the Plasma Cannon! Its a full on space colony experience in a box. Matches can be very brutal with 5 players almost leading to a fisticuffs. I think of it as space rugby where everyone dog piles on each other hoping to make some headway. Be prepared for some intensity! Since much of my gaming is exactly in that situation – a friendly game with my wife with whom I wish to continue to share a bed – I’m not sure AF will fit into that equation. Seth – Space rugby… that’s a an apt description! Hahah. I love the intensity of the expansion. Paul – I’ve read Ender’s review of AF, and I think, despite his wife’s propensity for fisticuffs, that he quite enjoys it. We do, too, and it’s not a problem when your wife consistently beats you! Seriously, though, Cherilyn and I have always found AF to be pretty low on the punk factor – it’s all good natured, and not too terribly confrontational. I wouldn’t have named it Game of the Year last year if Cherilyn and I found friction while playing it; we enjoy a friendly game and would want nothing less from our time spent together.